Scott Walker is traveling the country portraying himself as a straight shooter. "We said what we're gonna do, and we did it!" he told CPAC delegates in D.C. last month. But here in Wisconsin he has earned a reputation for governing by sneak attack and "bombshell," as the Milwaukee Journal Sentinel described the governor's track record of springing major policy changes on the public, stakeholders, and even legislators. Two years ago, Walker wielded his veto pen and struck a loophole from the the 2013-15 budget bill that could have inadvertently expanded the state's school voucher program. In last month's budget address, he instead announced that he would lift the cap entirely. Yet another bombshell? No, said his spokesperson Lauren Patrick, who hastened to assure the Journal Sentinel that the entire budget bill was "the result of months long work with staff, legislators and stakeholders." But a closer look at the drafting files for the K-12 sections of the executive budget bill, and what one major stakeholder—the Department of Public Instruction—requested, reveals something very strange. Not only did Walker's budget turn a deaf ear to to the department's requests for transparency and accountability, CMD can reveal that a Walker official actually instructed the non-partisan drafting bureau to hide the changes from the state's independent and non-partisan education agency. Advancing the privatization of the public school system, and turning community schools into for-profit money-making operations, has long been an American Legislative Exchange Council (ALEC) priority. In 1981, the corporate bill mill sent a copy of its voucher bill to "16,000 state and federal officials, including every state legislator in the country." ALEC stalwart and former Wisconsin governor Tommy Thompson signed the nation's first voucher program into law in 1990. When introduced, vouchers were billed as social mobility tickets for minority children attending underfunded inner city schools, and they were restricted to students from families earning less than 175 percent of the federal poverty level. Gov. Walker upped the income requirement to 300 percent, which drew the ire of some of the early supporters, such as Annette "Polly" Williams, one of the original authors of the bill. "They've hijacked the program," she told the Milwaukee Journal Sentinel in 2013. Walker's attempts to expand the number of students enrolled were pushed back by legislative leaders, including Republican Senate President Mike Ellis. When right-wing attack dog James O'Keefe and other Walker supporters did a video hatchet job on Ellis in 2013 resulting in his retirement, they laid the groundwork for a further voucher expansion in the state. A "Modest" Proposal for Tuition-Free and Non-Profit Schools? Reviewing Wisconsin voucher programs, DPI saw a system that had gone awry and betrayed its original promise of closing achievement gaps. DPI also requested that new private schools signing up for the voucher programs be accredited, or, at the very least, that the schools have been in existence for two years. Furthermore, DPI took action to hold accountable one accreditor allowed to give the go-ahead for private and religious schools receiving tax money through the programs. The National Council for Private School Accreditation, which in the 1990s boasted that ALEC served on its advisory board, has an abysmal track record. It authorized seven out of the nine schools that have been terminated from the voucher programs since 2011, costing taxpayers more than $20 million. DPI asked that the NCPSA be given the boot. What the department did not ask for was an expansion of the voucher programs. In fact, amid fears that a loophole in the 2013 budget bill would render the voucher cap moot, Superintendent Dr. Tony Evers issued a warning. An expansion, he said, could set taxpayers back by $1 billion dollars “over a short period of time,” and create a separate and unequal school system draining money from public K-12 schools. Governor Walker's executive budget, however, did the opposite. Walker's budget lifted the cap while nixing almost all of the measures DPI had asked for—from non-profit schools to bare-bones requirements for school accreditors. And the governor's budget analyst, Megan Stritchko at the Department of Administration, made sure that the DPI was excluded from the process. "Please do not discuss any of the changes with the DPI," she told the nonpartisan lawyer drafting the bill as this email shows below. The unusual request flies in the face of the public assurances that stakeholders were participants in the process. "He simply did not reach out to us," Tom McCarthy of DPI told CMD. CMD has filed an open records request with the Department of Administration to find out whether the request to leave DPI out of it came from the top. The Wisconsin voucher program, which allows K-12 students to attend private and religious schools on the taxpayers' dime, currently enrolls 29,000 students, and drains more than $69 million out of struggling Milwaukee public schools each year. With the limitless expansion of the statewide program, which is currently capped at 1,000 students, public schools across Wisconsin will likely find themselves facing significant budget shortfalls. "Every child deserves to succeed," Walker said when he announced that he would lift the cap. But with 25 years of hindsight it is becoming increasingly clear that the Wisconsin voucher programs are failing the poor, minority and at-risk students they were purportedly designed to help. An independent 2012 review by the Wisconsin Legislative Audit Bureau found that Milwaukee voucher students score slightly worse than students in the district's public schools, but what's even more worrying—they enroll fewer students for whom English is a second language, and only a third as many with disabilities. This prompted congressman Mark Pocan (D-WI) to ask for an independent federal probe into "alarming allegations of potentially discriminatory practices" within the schools enrolled in the program. As the schools are exempt from most state regulations, they have no obligation to provide a comprehensive education—much less a secular one. Carter’s Academy in Milwaukee, for example, uses the K-12 curriculum designed by fundamentalist Christian publisher A Beka Books, which is notorious for homophobic lesson plans on the “gay lobby” and for portraying the Ku Klux Klan in a positive light. But all of this—let alone the objections from DPI—does not bother Walker who has pushed for one of the most extreme expansions of vouchers in any state. "Every child deserves to succeed," Walker said when he announced his sweeping expansion. But vouchers were not designed to help children; the scheme was cooked up out of an ideological dislike of public "monopolies," democratically elected school boards and teachers' unions. 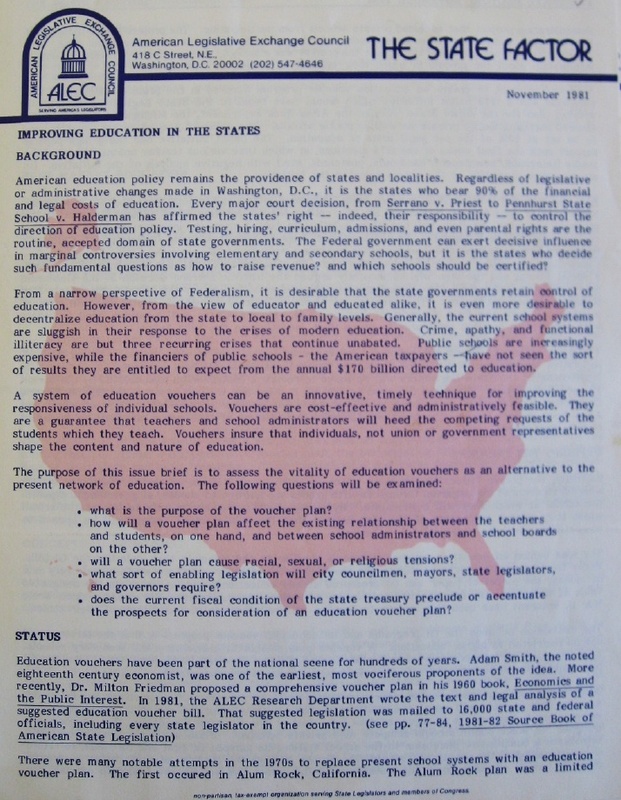 University of Chicago economist Milton Friedman, who first floated the idea in a 1955 essay, lectured a 2006 ALEC meeting on the need for vouchers. "How do we get from where we are to where we want to be?" he asked. The ideal way "would be to abolish the public school system." But alas, "you're not gonna get there." Dismantling public schools in one fell swoop would be political suicide, but introducing a universal voucher system, he explained to thunderous applause, is a politically more palatable way of reaching the same goal. See the drafting file for the voucher sections of Walker’s Budget Bill here. Scooter's comment is pretty much the opposite of reality. His MO has been to turn on the cloaking device at election time and then unleash the hounds right after. Neither Act 10 nor RTW even came up during his two regular elections, then suddenly were fast tracked by his legislative henchmen. Walker is great at claiming to be the opposite of what he really is.